Demolition crews have begun to tear down the D.C. house where Savvas and Amy Savopoulos, their son Philip and housekeeper Vera Figueroa were held captive and killed almost two years ago. 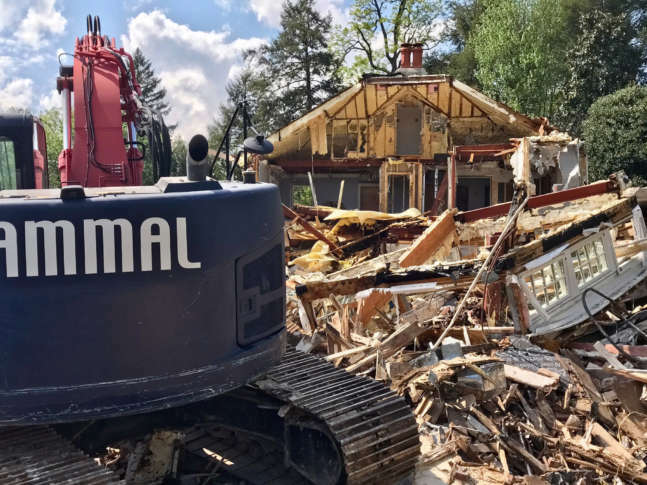 WASHINGTON — Demolition crews have begun to tear down the D.C. house where a couple, their 10-year-old son and housekeeper were killed nearly two years ago. The corner lot on Woodland Drive was home to the Savopoulos family until May 14, 2015. The bodies of Savvas and Amy Savopoulos, their son Philip and Vera Figueroa were found after the house was set on fire and their attacker had fled with $40,000 in ransom. The five-bedroom, six-bathroom house located in a posh neighborhood in the shadow of the National Cathedral was once valued at $4.5 million. But the home sold months after the brutal killings for just $3 million. D.C. property tax records list Four Quartets Trust as the current property owner. A worker said the demolition work would wrap up by noon on Monday. The man charged with killing the four, Daron Wint, is set to go on trial in September.